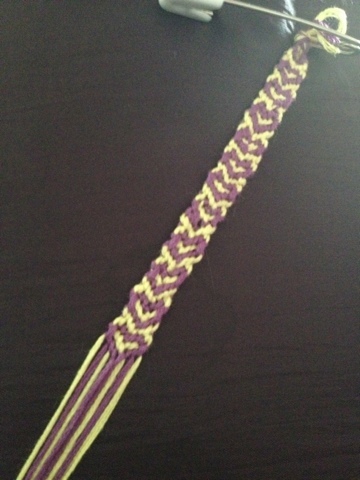 So I found a tutorial through Pinterest for a knotted friendship bracelet with a heart pattern. As soon as I saw it, I knew I HAD to make one! Luckily, I had some cotton in my crafty supplies. I set to work on it yesterday. It is tricky! You have to knot from both sides and join in the centre. There is lots of changing directions and can get confusing! It's even harder, having an overactive 11mth old lil girl who has recently decided to start opening and pulling everything out of the cupboards! Depending on how this works out I, hope to post a tutorial for this in a few days.